Mobility in 2017 is all about 5G, which is not just another “G” – its scope is far larger. Previous G’s focused on increasing bandwidth and latency to support Mobile Internet consumption patterns accelerated by universal adoption of smart devices. The revolutionary attributes of 5G converge the latest innovations in network, cloud, and devices in a way that has never been done before. 5G’s impact will be far reaching across industries generating massive value not possible in previous technology shifts. Ultra-broadband communication and computing power will combine and extend across networks and devices such that information and computing power will be instantaneously available. 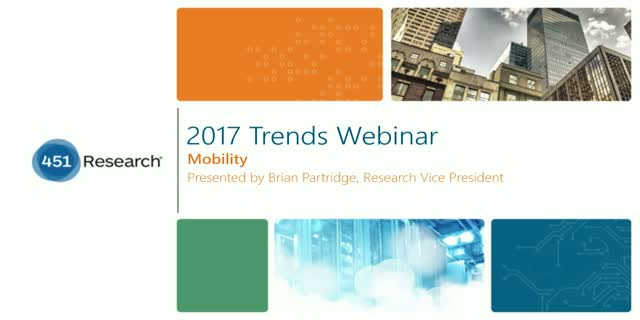 Join Brian Partridge, Research Vice President for Mobility, as he explores how this will catalyze a wave of innovation in applications, services and functions built to run on the new 5G infrastructure.